In terms of accessories the Apple iPad mini 2 comes with a lightning cable and an A/C adapter - hardly a surprise after a few generations of tablets already. There are of course the usual leaflets and a couple of stickers. The retail box this year has almost twice the height of the last year's mini packaging. The culprit is the bigger 10W 2A charger (as opposed to last year's 5W unit), which is the same as the one supplied with the iPad Air. 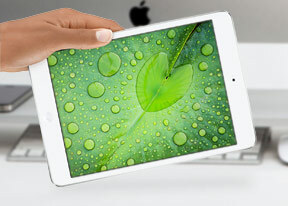 There are no two ways about it, the new iPad mini looks just the same as the old iPad mini. It even measures pretty much the same so you would have some pretty hard time telling the two apart with their screens off. Here's a tip for you, a little telltale feature is the second microphone pinhole, which can be seen on the back of the iPad mini with Retina screen. It's close to the camera lens and it's about the only difference in their machined aluminum bodies. The new iPad mini comes in the same "black front/gray back" and "white front/silver back" paint jobs, both of which look exactly the same as on the Air even on closer inspection. The iPad mini is like a miniaturized carbon copy of the iPad Air too - complete with a smaller Home key and thinner bezels. The volume keys and the silencer switch and the camera lenses are identical in size on both iPads. The downsizing was only limited to the exterior. They share the internals - the same camera and the same A7 chipset. When you turn on the iPad mini 2 it becomes evident where all the work has gone into. The new high-resolution Retina IPS LCD screen is spectacularly sharp. On a 7.9-inch diagonal, the new resolution of 1536 x 2048px works out to a pixel density of 324ppi. That's four times the pixel count and double the pixel density compared to the original mini. Above the screen (if you can take your eyes off it) we find the same 1.2MP resolution front-facing camera as last year. It's capable of 720p video capture. Next to it, there's an ambient light sensor, which helps in adjusting the screen brightness automatically. Under the screen lies the familiar home button. We all hoped to see Touch ID fingerprint sensor on the iPad mini 2 and iPad Air much like on the iPhone 5s, but to no avail. So, perhaps next year? The left side of the iPad mini 2 is completely free of any controls, while on the right we find the the two volume keys and the silencer switch (that one can also lock screen orientation if you choose so in the system settings). The volume keys have solid feedback and are generally very comfortable, the only usability problem is reaching them when you hold the tablet in landscape orientation - they are quite far off from where you fingers would rest and not directly visible when you look at the screen straight on. Last year's stereo speakers are here as well. These are hardly unforeseen as it was namely the original iPad mini that premiered the double speakers setup in the iPad family. Subjectively, the speakers don't leave an impression of being as loud as we hoped - we'll test their loudness further in our review. The issue with the speaker setup remains the same as before - they are really easy to muffle with your hand when holding the iPad in landscape orientation. Also they are so close together that we couldn't spot a perceivable stereo effect in whatever game or video. At the bottom, set in-between the two speakers, we find the now typical Lightning connector port. The top of the iPad mini 2 is reserved for the 3.5 mm headphone jack and one of the two microphones. The second microphone is on the back of the slate, close to the camera. This year Apple introduced a dual mic setup, which is used for active noise cancellation in things like FaceTime calls or talking to Siri. The system works just fine isolating your voice nicely during calls when you hold the iPad in front of you. The 5 MP camera sits on the back of the new iPad mini, in the top left corner. It's got a F/2.4 aperture and it's got a viewing angle of 33mm (in 35mm terms), so not much of a difference to last year. There is no LED flash much like there isn't one on the iPad Air or the last year's iPad mini. The iPad mini 2 sits comfortably in your hands in both portrait and landscape orientation and many of us find this sort of screen size to be the sweet spot for a tablet. iOS looks like a natural fit for the 7.9-inch screen and it doesn't feel as if we're using a blown up iPhone interface as it does on the iPad Air.